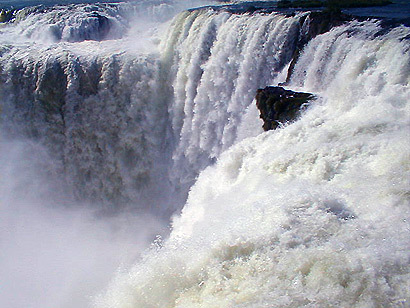 The content of this link is a recopilation of the best information about the Waterfalls. We want to share it with you (our customers and friends). We will be very happy to receive your travel comments and input. Please send us your feedback by e-mail to post it in our website. Iguazu Falls is located where the Iguazu River tumbles over the edge of the Paraná Plateau, 23 kilometres (14 mi) upriver from the Iguazu's confluence with the Paraná River. Numerous islands along the 2.7-kilometre (1.7 mi) long edge divide the falls into numerous separate waterfalls and cataracts, varying between 60 metres (200 ft) and 82 metres (269 ft) high. The number of these smaller waterfalls fluctuates from 150 to 300, depending on the water level. About half of the river's flow falls into a long and narrow chasm called the Devil's Throat (Garganta del Diablo in Spanish or Garganta do Diabo in Portuguese). The Devil's Throat is U-shaped, 82-meter-high, 150-meter-wide, and 700-meter-long. Placenames have been given also to many other smaller falls, such as San Martin Falls, Bossetti Falls and many others. About 900 meters of the 2.7-kilometer length does not have water flowing over it. The edge of the basalt cap recedes by 3 mm (0.1 in) per year. The water of the lower Iguazu collects in a canyon that drains in the Paraná River, a short distance downstream from the Itaipu Dam. The junction of the water flows marks the border between Brazil, Argentina, and Paraguay. There are points in the cities of Foz do Iguaçu, Brazil, Puerto Iguazú, Argentina, and Ciudad del Este, Paraguay, which have access to the Iguazu River where the borders of all three countries can be seen, a popular tourist attraction for visitors to the three cities.